with Jacques Goudstikker, Amsterdam, by 1926. W. Stechow, Salomon van Ruysdael, Berlin, 1975, pp. 20, 50 and 104, no. 236, illustrated pl. 12. C. Wright, Paintings in Dutch Museums. An Index of Oil Paintings in Public Collections in The Netherlands by Artists born before 1870, London, 1980, p. 399. Old Master Paintings: An illustrated summary catalogue, Rijksdienst Beeldende Kunst (The Netherlandish Office for the Fine Arts), The Hague, 1992, p. 261, no. 2284, illustrated. Rotterdam, Rotterdamsche Kunstkring, Catalogue de la Collection Goudstikker d'Amsterdam, 10-25 April 1926, no. 82, illustrated. Amsterdam, Kunsthandel J. Goudstikker N.V., Catalogus der Tentoonstelling van Werken door Salomon van Ruysdael, 1936, no. 7, illustrated. Michigan, Grand Rapids Art Museum, Landscapes from the Golden Age, 19 May-19 June 1972, no. 25. Leiden, Stedelijk Museum De Lakenhal, Het Hollandse 17de eeuwse landschap, 20 October-26 November 1972, no. 25, illustrated. Salomon van Ruysdael, the uncle of Jacob van Ruisdael, is recorded as a member of the Haarlem painters' guild in 1623, but it is not known who his teacher was. His early work shows the influence of Esaias van de Velde and in the 1620s and 1630s he developed a more monochrome style, his so-called tonal phase, a period during which the present composition was painted. His dune landscapes from this period were particularly influenced by Pieter Molijn, both finding inspiration in the sandy and hilly terrain close to Haarlem. Van Ruysdael's river landscapes, on the other hand, betray a knowledge of the work of Jan van Goyen. Later in his career his colours became brighter and his compositions started changing, probably due to the influence of his nephew. 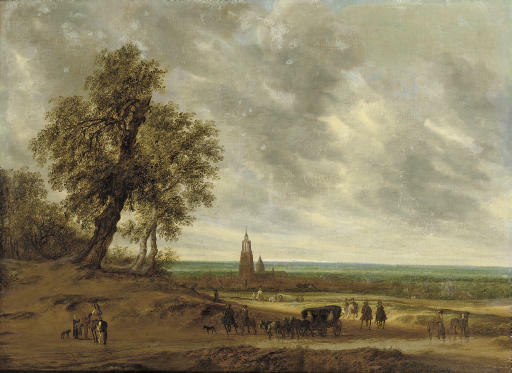 In many instances, recognisable towns can be seen in the distance of his landscapes, for instance Arnhem, Haarlem, Deventer and, as in the present picture, Amersfoort. Here the two main churches of Amersfoort can be identified as the 'Lieve-vrouwe kerk' (the Church of Our Lady) and behind it the 'Sint Joris kerk' (the Church of St George). The artist used a similar compostion for his View of the Abbey of Egmond again in 1640 (Kimbell Art Museum, Fort Worth, Texas; see W. Stechow, op. cit., p. 105, no. 239). Please note an additional exhibition: Tokyo, Le Musee National d'Art, European Landscape Painting, 14 September-26 October 1978, no. 12 (according to a label on reverse of frame).